I haven't been around for a little bit. Birthin' and takin' care of a baby! 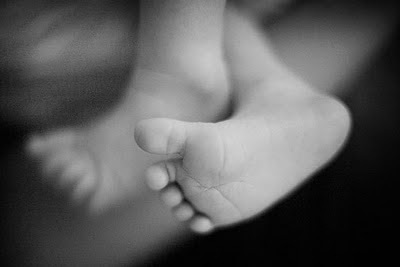 I've decided I am not going to pimp him out on my blog by posting all kinds of pictures, (you know--babynappers and stuff,) but I will post a pic of the most adorable baby feet you've ever seen. Those tootsies are a pretty good indicator of the cuteness we're dealing with. Everyone is doing well; adjusting to parenthood and babyhood. I'll be back soon on the blog because, wouldn't you know it? --some racial -ish has been going on during my absence.